GREENWOOD—Heads bowed in prayer in the presence of the Blessed Sacrament, archdiocesan seminarians prayed for vocations to the priesthood and religious life on Dec. 1 at Our Lady of the Greenwood Church. After leading the Angelus at noon, Bishop Christopher J. Coyne, apostolic administrator, delivered a brief reflection on the Blessed Mother. 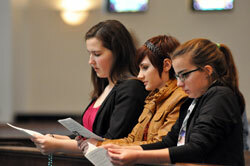 Christ’s presence in the world today is made manifest in the holy Catholic Church, Bishop Coyne said. “When we listen to the teaching of the Church, … when we read it, when we are instructed by it, we open ourselves to the possibility of being led by the Church to grow in God’s love. During the holy hour organized by the archdiocese and seminarians, Father Eric Johnson, archdiocesan director of vocations, reflected on a Scripture passage from the Gospel of St. Matthew about how the harvest is plentiful, but laborers are few so we must pray for more laborers (Mt 9:36-38). Jesus is calling us, he said, to offer our lives in loving service to others. “How is God calling us at this moment—with the people that surround us—to love and to serve him?” Father Johnson asked. “How are we called concretely to recognize the gift in those that surround us, to nurture that gift, to hold up that gift, to lift up that gift? … Those gifts make all of us a little bit more holy and a little bit more fully what we are called to be. The health of the Church’s priesthood and religious life is a concern for all of us, he said, and we must pray daily for an increase in vocations.